Our 75 foot Active High Speed with Ethernet HDMI cable meets the latest standard put forth by the HDMI standards committee. It is fully backwards compatible with all previous HDMI versions. This active cable comes with a booster chip to enhance the signal on longer cable runs. The HDMI cable is the newest and best digital video connection on the market. HDMI is the only cable that can transfer uncompressed high-definition video and multi channel digital audio in resolutions up to 4K (Ultra HD). HDMI cables are convenient because they will allow the transfer of digital audio and video in a single cable, permitting a less confusing mess of wires and a cleaner entertainment center. The HDMI connector is small, which makes it ideal for installers and in-wall use. 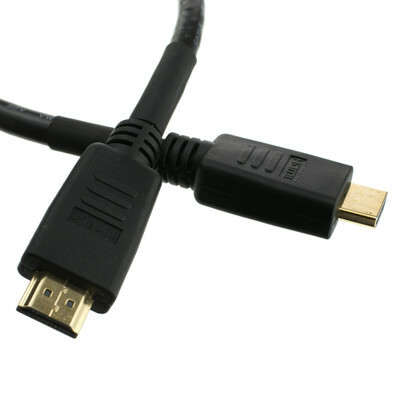 HDMI cables can be used with any device with HDMI such as HDTVs, DVD players, Blu-ray players, game consoles, cable and satellite set top boxes, DVRs, computers, etc. NOTE: This Active cable only works in one direction. The connector marked "input" plugs into your source HDMI device, cable box etc. and the connector marked "output" plugs into your display or TV.